Oregon’s wine industry has seen some explosive growth over the past few years with Oregon Pinot Noir making some serious waves internationally. A drive down 99W through Newberg and Dundee is now so littered with blue signs pointing to a plethora of wineries, it’s hard not to be completely overwhelmed. The dizzying number of choices often leads people to pick out the more well-known wineries to visit like Argyle, Ponzi or Archery Summit and miss some of the smaller, more hidden wineries. Unfortunately this often results in tasting rooms with wine enthusiasts packed elbow to elbow trying to sample Oregon wines. On a recent trip to the region, we set out to find a couple of lesser known wineries worth seeking out on the Oregon wine trail. Lange Estate Winery and Vineyards is down a dusty and bumpy road off 99W. We had originally set out to visit Torii Mor, which is on the same road but closer to 99W. After a highly disappointing tasting at Torii Mor (uniformly underwhelming wines mostly sourced from outside the region), we decided to take a chance and continue down the road to give Lange a shot. 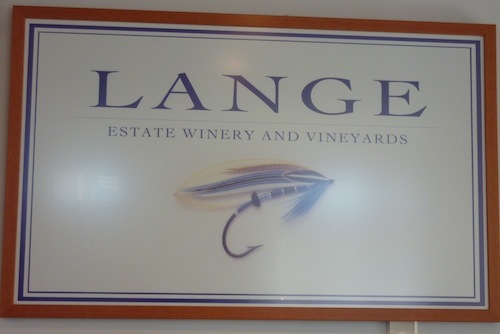 As we walked in the door of Lange we were instantly struck by just how different the vibe was from some of the other wineries we had visited. Earlier in the day, the folks at Argyle Winery were cordial but a little cold, and the guy from Torii Mor gave off a vibe akin to a used car salesman, but at Lange we were welcomed warmly and enthusiastically. The woman running the tasting started out as a member of the Lange wine club and fell so in love with the wines and winery that she took a job in the tasting room. Tasting wine with someone who actually loves the wine is a much better experience, and at a great winery it’s not uncommon for a winemaker or tasting person to taste along side you (and, of course, spitting into a spit bucket). Lange’s tasting menu consisted of a 2009 Pinot Gris, 2008 Chardonnay, and three different 2008 Pinot Noirs. While Pinot Noir is often the big draw for Oregon wine tasters, Lange’s Pinot Gris is a very special wine worth seeking out in its own right. While we aren’t normally fans of Pinot Gris, the 2009 Lange Pinot Gris is barrel fermented in neutral oak (something not normally done with the wine). This gives the wine an amazing quality and rounds out the typically sharper wine. It was one of the first bottles of Pinot Gris we bought from an Oregon winery and one we completely fell in love with. Lange also produces wine under the Domaine Trouvere label and their 2007 Chardonnay was fantastically balanced with a nice buttery quality in symphony with slightly sweet fruit notes. 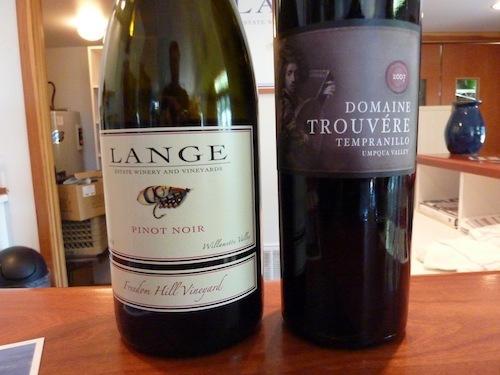 The big show at Lange is of course the Pinot Noir. The 2008 Pinot Reserve is flavorful and sweet with a nice finish, balanced with just the right amount of jam and cherry. The 2008 Pinot Noir Three Hills Cuvee has notes of strong deep fruit, with lovely strong notes that make it a bigger and bolder pinot. Finally we tasted the 2008 Freedom Hill Vineyard Pinot which is much spicier and full with bold notes, a much more traditional and less fruity pinot. Many of the wines we tasted are sold directly out of the tasting room with prices ranging for $22-$60. We considered them all great wines from a winery that is truly a hidden gem. Down 99w toward Dundee, up a windy dirt road and just down the street from Archery Summit is De Ponte Cellars. We love the wines produced from the grapes just up the road at Archery Summit and were curious to see how De Ponte fared with similar soil and growing conditions. The answer is very well. Like Lange, De Ponte Cellars features a unique wine that really isn’t being done anywhere else in Oregon. Their 2009 DFB Estate Melon is a very dry white wine with green apple and Asian pear notes. It’s hard to think of a better wine to pair with fresh Oregon oysters – it’s a wine almost custom made for shellfish. 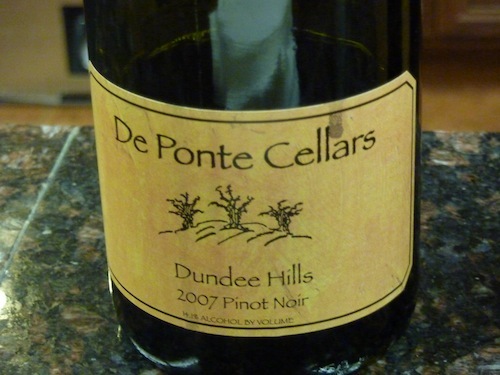 As with most Oregon wineries, the big show for De Ponte is their Pinot. We tasted three pinots: 2008 Clay Hill Pinot, a very big nose, bold flavor with nice finish, the broad jammy fruit notes very well complimented by the oak; 2007 De Ponte Cellars Dundee Hills Pinot Noir, richer and spicier than the Clay Hill, this a is a bold wine with a strong finish (it costs $38 but tastes $60+); and, 2006 De Ponte Cellars Dundee Hills Pinot, a more refined and well rounded pinot with a sense of elegance to it, a real winner. Unlike many of the other tasting rooms we experienced during our wine trek, De Ponte Cellars actually had the winemaker, Isabelle Dutarte, pouring her own wines. Talking to the vintner really enhances the experience of wine tasting and gives you a great opportunity to learn more about the wines and the winery. 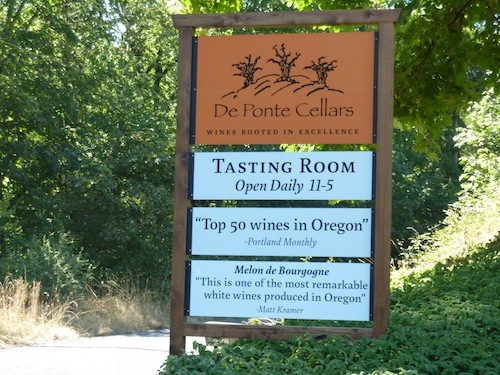 De Ponte Cellars wines range from $24 – $42 a bottle and all tasted like wines twice the price. 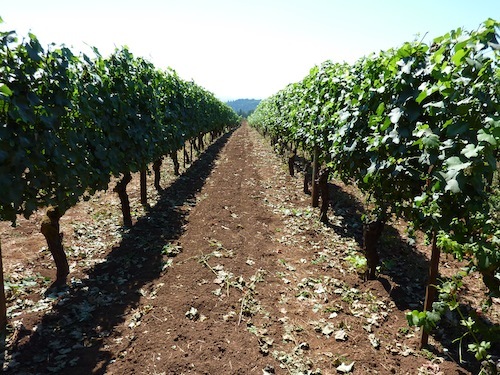 Touring the Oregon wineries around Newberg and Dundee is a fantastic day’s activity (we combined it with an Oregon helicopter tour in Newberg with Holmes Helicopters). It takes about 45 minutes to get there from downtown Portland, and if you’re driving you can reasonably hit about four wineries with a long break for lunch. We recommend Farm to Fork in Dundee for a nice leisurely lunch. They’ve got great sandwiches and a nice outdoor patio. The service is slow so it’s a perfect spot to take an extended break. 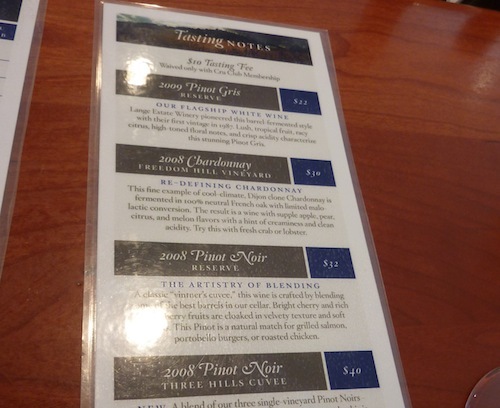 Wineries charge $8-$10 for their tastings (which usually include 4-5 wines). Almost every place we went to permitted us to split a tasting between two people and the pours are usually generous. Wineries will waive the tasting fee with larger purchases, but we never managed to hit that threshold, even at wineries where we bought a few bottles of wine. 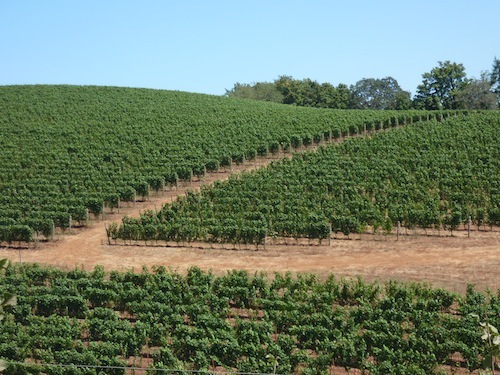 For more information about the Oregon wine trail and the wineries in the Dundee Hills, visit the Dundee Hills main website. Here’s a map of the region and wineries. While these are fantastic wineries, I'd hardly call Lange a hidden gem, DePonte perhaps. There are actually some terrific real hidden gems in the Dundee Hills, hope you continue to explore the region, finding new discoveries. Are you saying Lang isn't hidden, or it isn't a gem :) ? Your suggestions of other gems are more than welcome!! I just went to a tasting of over twenty 2008 Oregon Pinots and De Ponte's Dundee Hills was my second favourite. I know my favourite was from Ken Wright but I can't remember what vineyard. I think DePonte is one of Oregon's treasures, and Isabelle Duarte is one of Oregon's best winemakers right now. Lange is definitely a gem in its own right, just hardly an unknown one. As far as other more hidden gems in the Dundee Hills, IMHO: White Rose is starting to get its dues. Vista Hills is great, as is Bella Vida. And Anderson Family truly defines the term gem. Look forward to your continued reports!